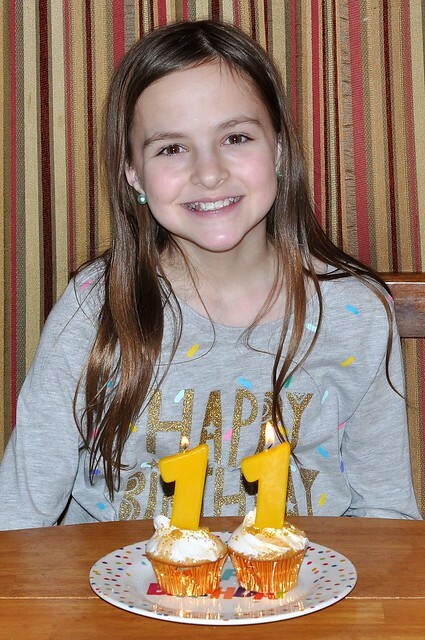 Our beautiful Alexandria Elizabeth celebrated her 11th Birthday today! The day Lexie was born was one of the happiest days of my life, and she continues to be an absolute joy who fills our days with so much love. Lexie is an extraordinary human being, and we celebrated her to the fullest today! 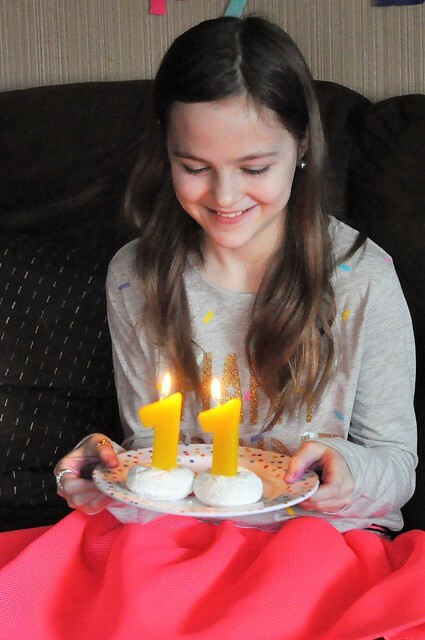 I still can't believe my first baby girl is ELEVEN! 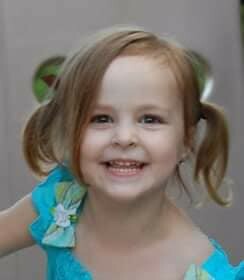 I swear, she was just an itty bitty adorable girl. Today was one of those days where I felt shocked by just how fast time flies. We are two years away from the teenage years and seven years away from her leaving for college. STOP!!! 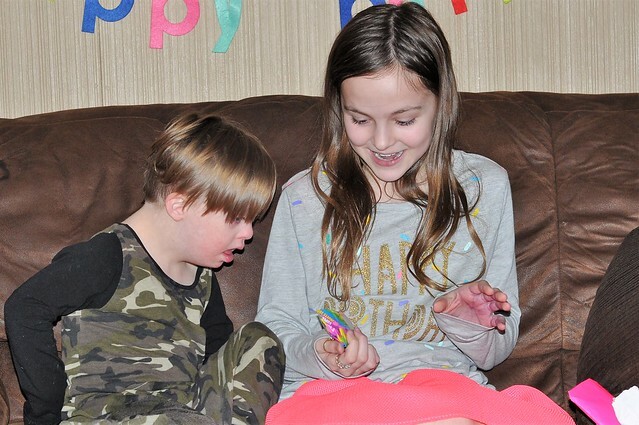 I know I've mentioned it before, but birthdays are a REALLY big deal in our home! 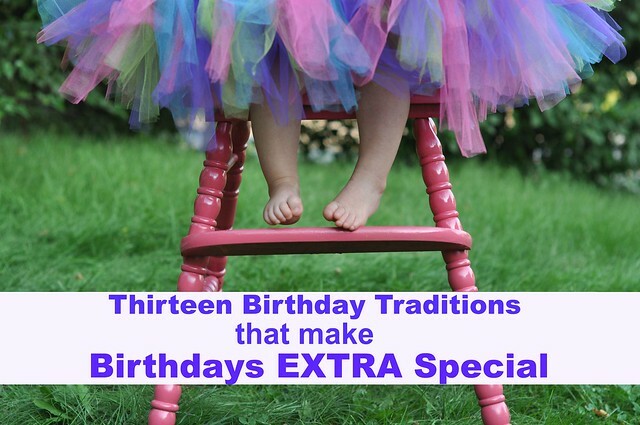 As most adults know, birthdays tend to lose their magic after a certain age, so we make them extra special while we can. 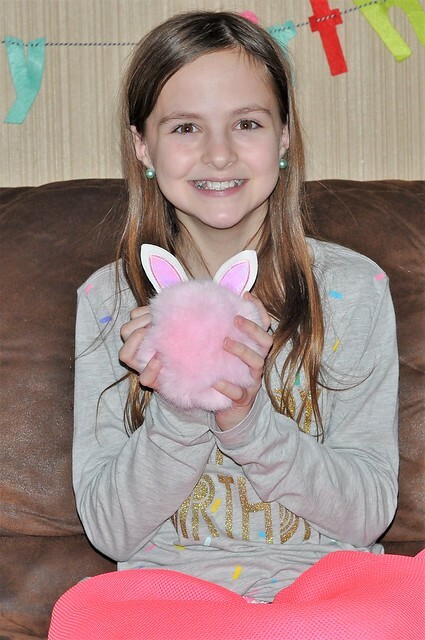 And Lexie had a great birthday today! 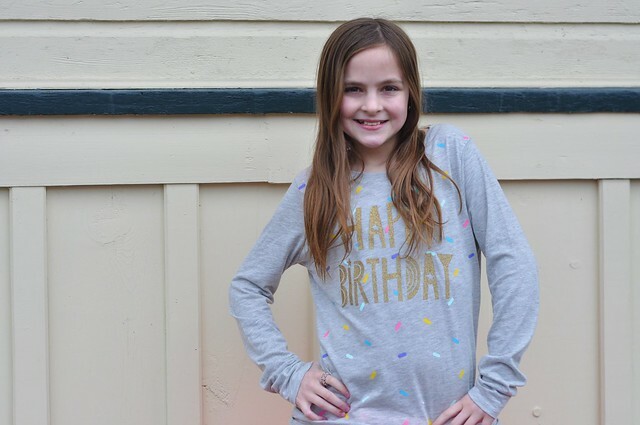 Lexie's day started off with sleeping in a bit, because, ahem, we give our kids the option to stay home if their birthday falls on a school day. 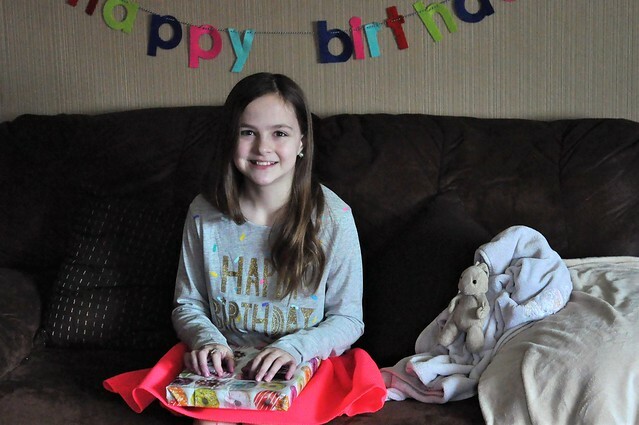 Lexie loves school and hates to miss days, so this was the first year she decided to stay home on her birthday. Because it was her first year doing this, I planned an extra special day with her! 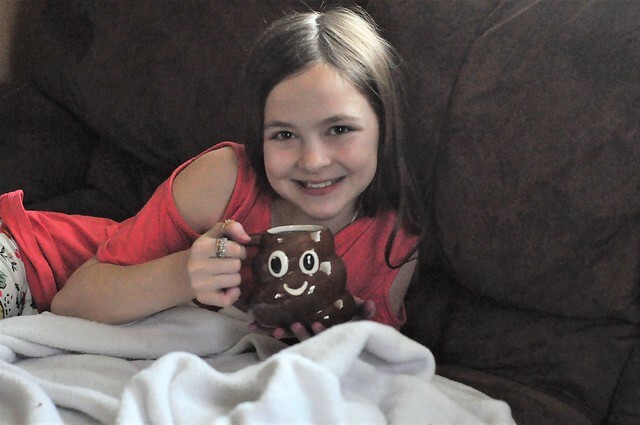 When she woke up, we snuggled a bit, then drank hot tea together (in her new Poo Emoji mug, of course) while watching two episodes of NCIS (her favorite, as mentioned below)! 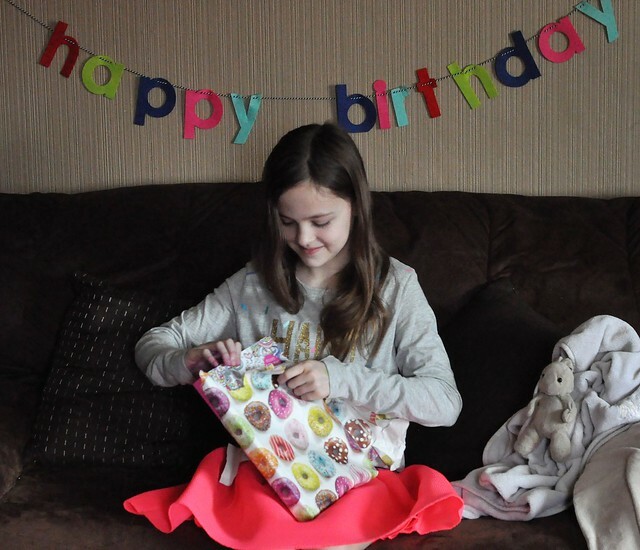 She decided to wait for Liam to wake up before we started the usual birthday traditions: a new birthday outfit, an early gift, the birthday song, and birthday donuts for breakfast! 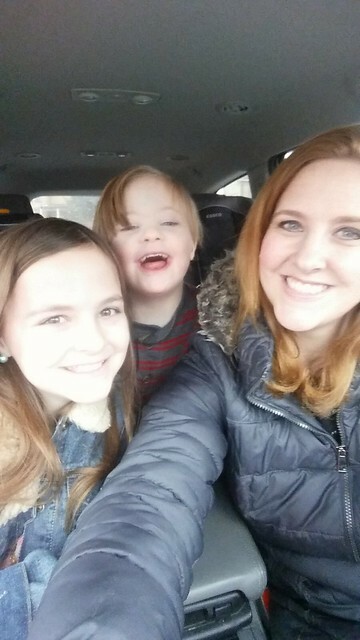 Because Lexie was home from school, she got to come along to drop Liam off at preschool and pick him up. He thought it was the best thing ever! After we dropped him off, we did something that many moms and daughters love to do: Go shopping! We browsed through all the aisles at TJ Maxx and Target. 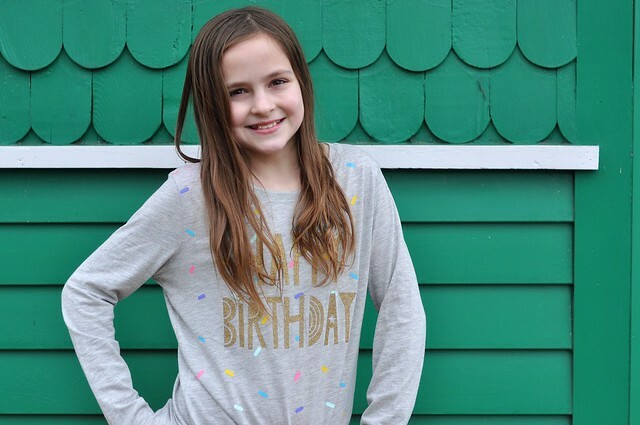 I let Lexie choose some new clothes for Spring and one birthday gift that she saw while we were shopping (which happened to be a mini backpack purse). We also picked up some things for our new puppy that will be joining us very soon! 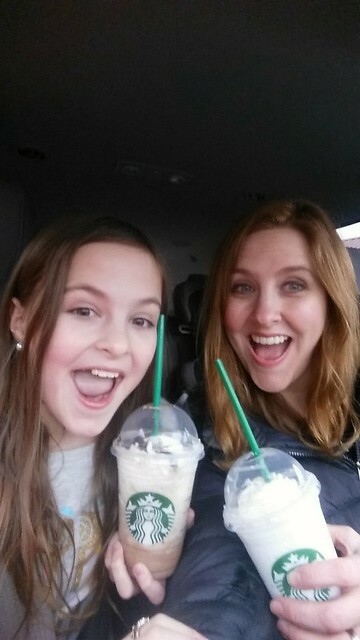 We had so much fun shopping together, and we concluded our trip with frappes from Starbucks! We picked Liam up from school on the way home, then hauled our shopping load into the house. Soon after we arrived home, Grant's mom came over for a visit, followed by my parents. There were only a few minutes of down time before we had to rush out for our next adventure! We soon arrived home (with blue teeth) and moved on to the final celebration of the evening: presents and cupcakes! It was a great day full of celebrating our adorable and sweet Lexie Bean! 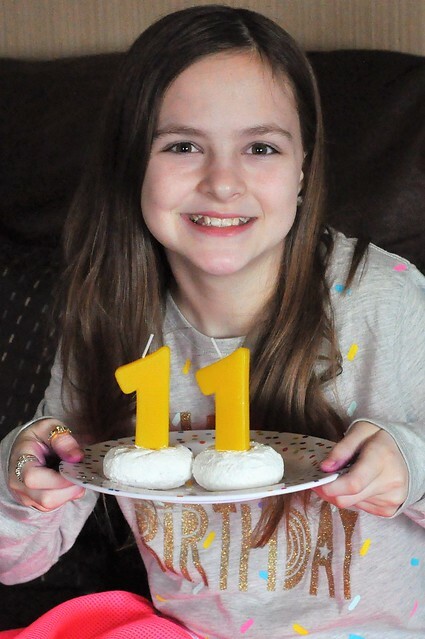 And just like that, she's 11! 2. FAVORITE TOY? Fashionista Barbies because they look different from the others. 9. FAVORITE LUNCH? Mac and Cheese or Ramen Noodles...those are both delicious! 11. FAVORITE DRINK? Iced Tea. And water! 12. FAVORITE SNACK? Smiley face fruit snacks because those ones are juicy...and delicious! 13. FAVORITE RESTAURANT? 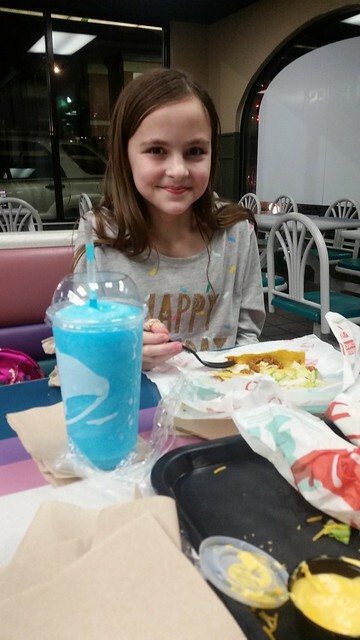 My favorite restaurant is Taco Bell! Oooo, and Applebees! 14. FAVORITE TV SHOW? Spongebob Squarepants! And NCIS! 15. FAVORITE MOVIE? That’s a hard one! The girl Ghostbusters! 16. FAVORITE ACTOR/ACTRESS? The guy who plays Spongebob. I want to meet him someday. That would be cool! 18. FAVORITE SINGER/BAND? Bon Jovi and Cyndi Lauper! Any 80’s person! 20. FAVORITE BOOK SERIES? The Babysitter’s Club. Well, the comic version. 21. FAVORITE OUTFIT? A t-shirt, poncho and leggings! 22. FAVORITE GAME? Pay Day! Whoop, whoop, I’m spending mon-ey! 23. FAVORITE SPORT? Soccer. Kick thee ball! 24. FAVORITE ANIMAL? A bun bun. Or a dog! 25. FAVORITE PLACE TO GO? Nina and Papa’s house! 26. FAVORITE THINGS TO DO? Hang out with Lexie and spend time with my family. And play with my future dog...haha! 27. FAVORITE SUBJECT? Science and math. Because in math you just keep on learning...fractions and decimals, and all that advanced algebra. And geometry! 28. 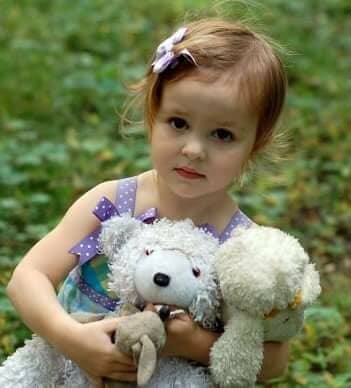 FAVORITE STUFFED ANIMAL? Bun Bun...and Blankie! 29. FAVORITE DAY OF THE WEEK? Friday and Saturday...mostly Friday because I get a little bit of school and a little bit of chill time and that’s a good thing! 30. FAVORITE MONTH? February. Wait! February, July and December! 32. FAVORITE HOLIDAY? My birthday and Christmas! You get presents either day and that’s AH-mazing! 33. WHO IS YOUR BEST FRIEND? Lexi! Aaaand...my family! 34. WHO DO YOU LIKE TO PLAY WITH? Lexi and my future puppy. I’m going to call her...I don’t know yet! 35. WHAT MAKES YOU HAPPY? Being around my family and doing something fun with my family. Like going to Deer Park, and going to the park, and getting a puppy together. Which we’re going to do on Saturday! Oh Em Gee, there’s going to be a puppy in our house, leaping around soon! 36. WHAT SCARES YOU? Clowns, being alone, and dying. That’s just scary. 37. WHAT MAKES YOU SAD? When an animal dies. 38. WHAT DO YOU WISH FOR? I wish for a playful puppy. 39. WHAT IS YOUR FAVORITE MEMORY? That’s a hard one! My 5th Birthday when I got my Barbie camper and that bike that had a bike for a Barbie on it. Also when our family went to Deer Park and the zoo. 40. WHAT DO YOU WANT TO BE WHEN YOU GROW UP? A vet! So I can save animals lives and make sure they are safe. 41. DISLIKES? I don’t like when people fight. It just makes me mad and ruins everybody’s day. 42. WHAT ARE YOU LOOKING FORWARD TO THIS YEAR? Getting a puppy! I cannot stop talking about this puppy until we get it on Saturday. Which is in two days. So that’s cool! 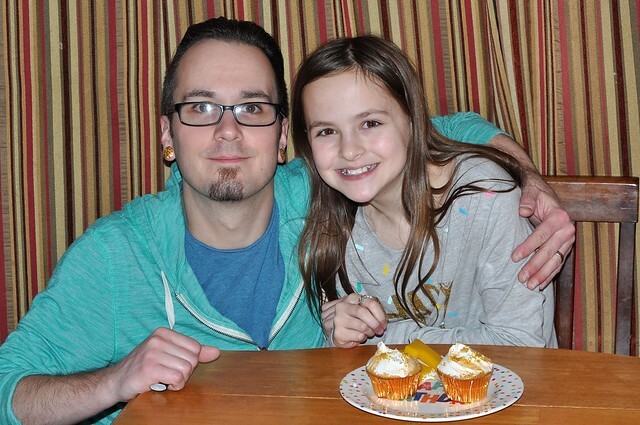 Happy 11th Birthday, sweet Lexie Bean! We love you SO much! Her extra comments in the interview are so cute! 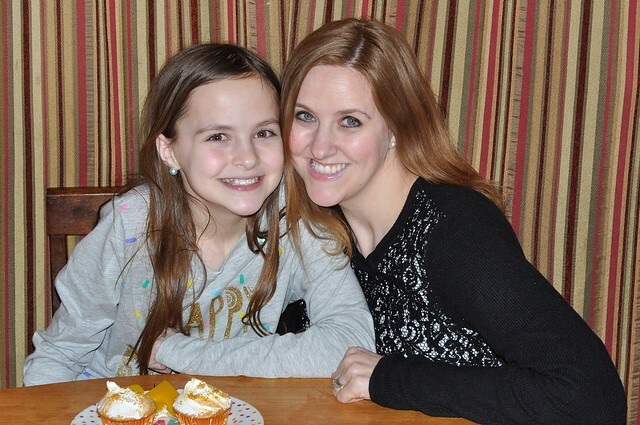 I love the mother daughter day you two had. Happy Birthday! 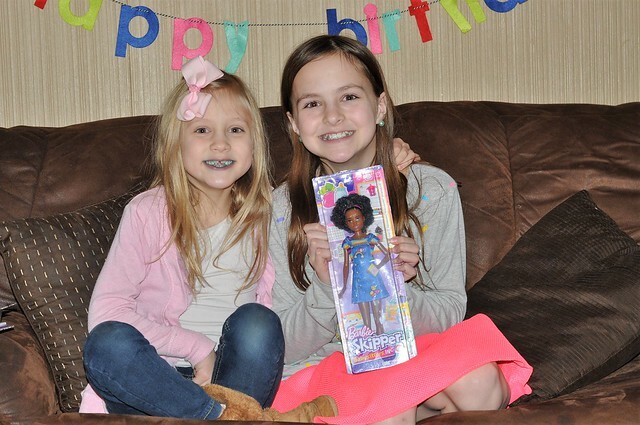 It looks like Lexie had a great birthday! The birthday interview is a great idea. It bet it'll be fun to look back on it in a few years and see how her answers have changed! Oh my goodness what an awesome birthday!! 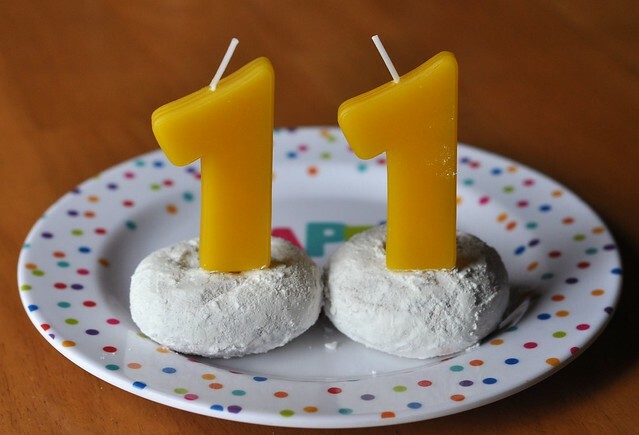 11!! That's big! I love that she got to spend the day with you, so so fun!! And she ate 10 tacos before?!! That's seriously impressive, haha!! 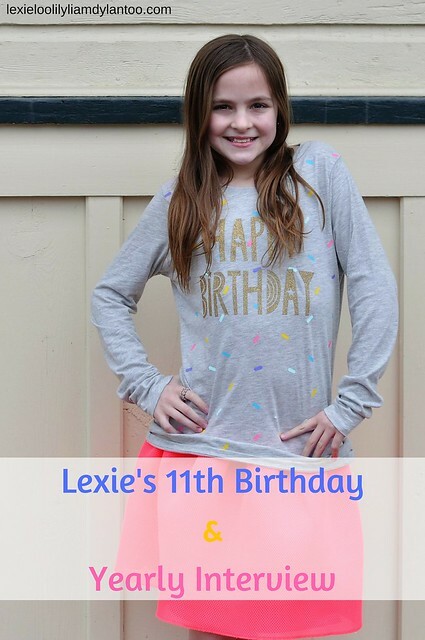 Happy Birthday, sweet Lexie! 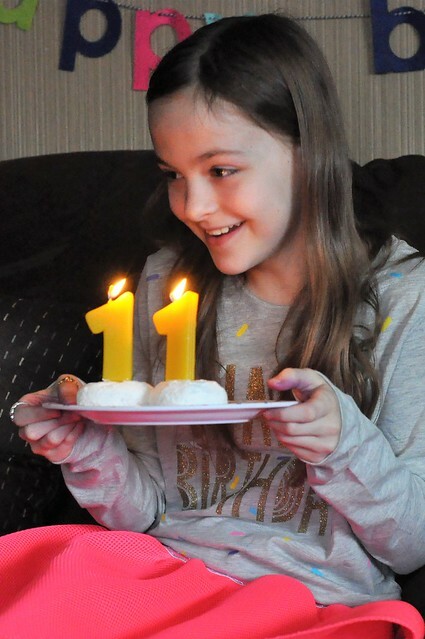 Oh goodness, 11!!! 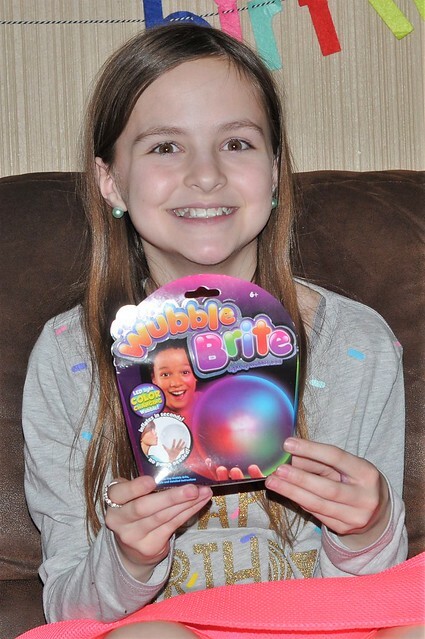 It literally feels like she just turned 10. Happy birthday, Lexi. 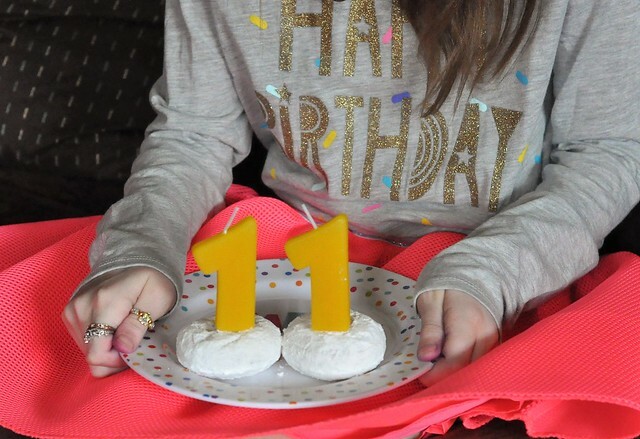 You're so right--"and just like that, she's 11." Gosh, I remember you writing about her when she was not much older than Liam. She's certainly growing into her very own person. I LOVE the fact that she loves Barbies, 80's music, and SpongeBob. How fun! She's also so excited about getting a puppy. Lewie's birthday is during the summer, but if his birthday was during the school year, I think we'd have to play a little hooky, too. It sounds like you all had one great day! 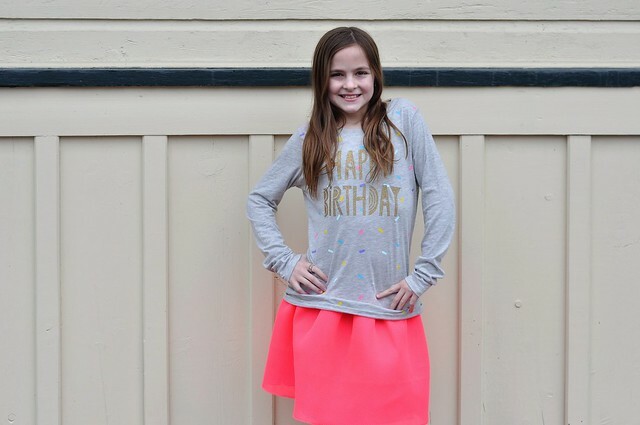 She is so beautiful and I can't believe she is 11 already!! Time truly does fly when you're having fun! Hope she had a wonderful birthday! !